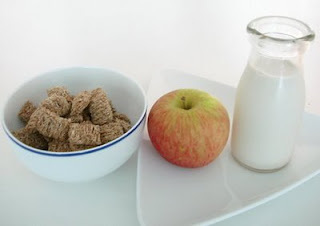 Will Kids Eat Simple Food? Vitamin Water sells everything from energy to relaxation to mental focus. So it makes me wonder--why even bother with "real food" when I can drink my happiness and eat it too! Kid and adult food packaging has gotten out of control. How will kids ever learn the true meaning of food if all they crave is the box with the seven foot yellow bird on it?? Gather, an apple-sliced by hand. A glass of milk or chocolate milk (soy, almond, dairy or rice milk). A glass of fresh squeezed orange juice. A hand made peanut butter and sandwich-using organic low in sugar ingredients. And a bowl of handmade trail mix--even with a few dark chocolate chips in it. Then on the other side of the table place a character-branded juice box. A character branded milk box (same flavor as used above. And a kid-branded granola bar--maybe even without any chocolate chips! ...Now let them choose! Free will! 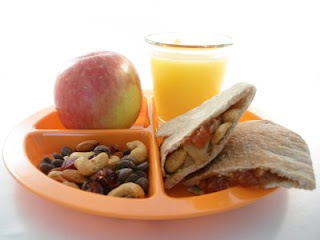 If your child chooses all the healthy non-branded items---bravo to you, lunch can be served! Try a blind taste test of all the ingredients. Then ask your child which they preferred in taste. If they choose the healthy stuff-yay for pure young taste buds. But if they have a taste for the less healthy items, you've got a bit more work to do. Next, try explaining to your child which items are loaded with sugar and which items are healthy in vitamins and nutrients that will help them grow strong! And next time you go to the store, spend a lot of time in the non-branded fruit and veggies sections--and try to spark some interest and curiosity in you child for healthier options. You can even print out a CIRCLE-IT GROCERY LIST featuring the Lunchbox Bunch characters.